Buoyed by the wild success of my post on Burnt Offerings, I thought I might use this space to write the occasional book or movie review. These will range in length and depth. Most will, I imagine, be somewhat short, but will hopefully give a flavor of the book or movie. 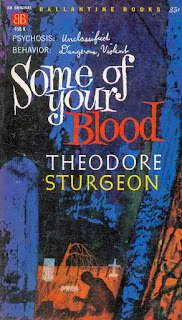 Today's selection: Some of Your Blood by Theodore Sturgeon. Told through letters and transcripts of therapy sessions, Some of Your Blood reads, in many ways, like Dracula. There are also italicized sections directed at the reader, by an unnamed narrator, presumably the author. These sections address the reader directly (second person) and talk about the book as a book. Very oddball. It took some getting used to, and it is a little slow at first, but stick with it; it's worth it. 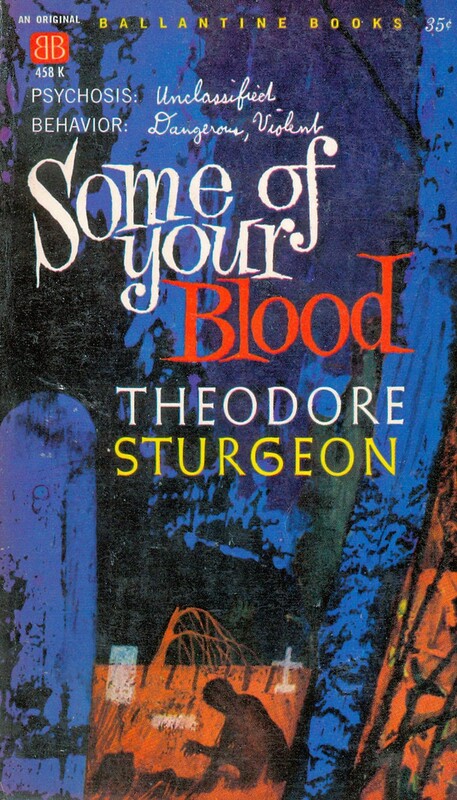 Some of Your Blood (what a great title!) is the story of a disturbed young man, called George Smith--though the nature of his malady is not revealed until much later--growing into adulthood in horrible conditions: a drunk, abusive father, a stint in a correctional facility. The book builds up to a quite disturbing and nightmarish final third, when George's psychosis is revealed. I don't want to say much more about the book than that. It's very much a novel of revelation, and to write too much about it takes much of the fun away. Highlight this area to reveal a discussion that includes some pretty big spoilers: So, Some of Your Blood is absolutely a modern take on the vampire novel. The structure is, as I said, reminiscent of Dracula, and George's real name isn't George. It's Bela. As in Lugosi. In many ways, the novel feels like a companion piece to Richard Matheson's I Am Legend. Both are modern updates on the vampire myth that utilized the science of the time. Matheson used biology to give his vampires a plausible explanation, Sturgeon used psychology. Would I recommend Some of Your Blood? Absolutely, though I'd warn folks used to modern horror that this reads differently than what they're likely familiar with. But readers who stick with it will be rewarded. Or maybe that's not the right word. "Rewarded" implies something far more cheery than the feeling you'll be left with when you finish Some of Your Blood. This one sticks with you, folks!